Learn how to configure Microsoft Message Queuing (MSMQ) in SharePoint to support asynchronous event messaging in SharePoint workflows. Important: The screen shots included here are from Windows Server 2008 R2. 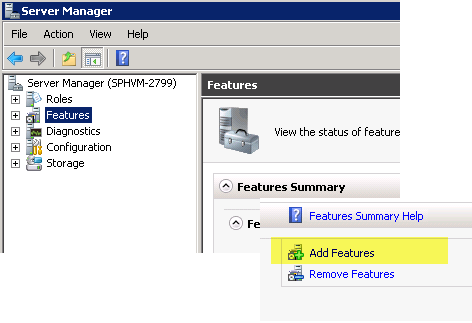 The UI may change for enabling this feature in Windows Server 2012. On your SharePoint Server computer, open Server Manager. Select the Features icon in the left pane, then select Add Features, as depicted in Figure 1. Figure 1. Adding the Message Queuing feature. In the Add Features Wizard that appears, select Message Queuing. Accept the default selections and then click Next, then click Install. Once restarted, open Server Manager and then open Message Queuing icon in the left pane. Notice that it now contains a Message Queuing folder and subdirectories, as depicted in Figure 2. In Windows Server 2012 you will not find the queues in Server Manager. Instead, go to Computer Management, then select Services and applications. Select the subdirectory named Private Queues. This is the directory in which your workflow event messages are stored. Figure 2. The Message Queuing feature added to Server Manager. When you first add the Message Queuing feature, the Private Queues folder is empty. 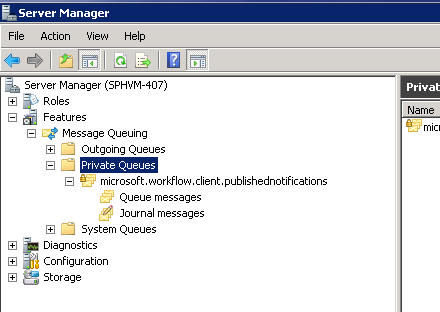 However, after a workflow runs that fires an event (or a workflow triggered by a SharePoint content change event runs), the Private Queues folder is populated as shown in Figure 2.